Summary: This monumental book tells the enthralling story of one of the greatest accomplishments in our nation’s history, the building of what was then the longest suspension bridge in the world. The Brooklyn Bridge rose out of the expansive era following the Civil War, when Americans believed all things were possible. So daring a concept as spanning the East River to join two great cities required vision and dedication of the kind that went into building Europe’s great cathedrals. During fourteen years of construction, the odds against success seemed overwhelming. Thousands of people were put to work. Bodies were crushed and broken, lives lost, notorious political empires fell, and surges of public doubt constantly threatened the project. But the story of the building of the Brooklyn Bridge is not just the saga of an engineering miracle; it is a sweeping narrative of the social climate of the time, replete with heroes and rascals who helped either to construct or to exploit the great enterprise. The Great Bridge is also the story of a remarkable family, the Roeblings, who conceived and executed the audacious engineering plan at great personal cost. Without John Roebling’s vision, his son Washington’s skill and courage, and Washington’s wife Emily’s dedication, the bridge we know and cherish would never have been built. Since David McCullough is one of my favorite authors, I was pleased to get the opportunity to read and review THE GREAT BRIDGE: The Epic Story of the Building of the Brooklyn Bridge. The novel was originally released in1972 and reissued as a 40th Anniversary Edition in 2012. Despite its 518 pages, THE GREAT BRIDGE is a very engaging novel that covers the social, political and technical aspects of building the Brooklyn Bridge. The mastermind of the project was John Roebling, a brilliant engineer, who in 1869 convinced the Brooklyn and New York leaders of the benefits in having a bridge over the East River connecting the two growing cities. Unfortunately John Roebling died early in the project and his son Washington Roebling became the driving force in completing the bridge. Washington,himself an outstanding engineer, suffered such severe physical disabilities during the fourteen year project that he could seldom visit the bridge site. Only with the help of his wife, Emily, and a very capable team of engineers was he able to remain in his job as Chief Engineer. THE GREAT BRIDGE is vintage McCullough as he takes the mundane subject of building a bridge, does thorough research, weaves in a bit of history and makes it come alive. His stories of the early years of John Roebling and his family add great depth to the novel as does his recounting of New York/Brooklyn politics and the involvement of Boss Tweed and Tammany Hall. In addition to addressing the political and social issues of the time, McCullough includes details of the difficulties encountered in constructing the bridge. The author provides insights into factors such as money, weather, illness, death, politics, rivalries and corruption that impacted both the time table and cost of the bridge. The original budget was exceeded several times and the final tally reached $15 million. Many of the workers constructing the footers suffered or died from a disease almost unknown at the time called caissons disease or “the bends”, a sickness created when moving from a high compression environment to a lower one to quickly. Caissons disease was most likely responsible for the many ailments suffered by Washington Roebling. In discussing the technical difficulties, McCullough first gives a brief history of suspension bridges and then delves into the unique problems at the Brooklyn Bridge site. He discusses in some detail such things as technical specifications of steel, building the underwater footers and hanging the hundreds of cables. The Brooklyn Bridge has definitely stood the test of time. It is remarkable that it was built right after the Civil War and has had only relatively modest changes to the structure over the 130 years of its existence. After reading THE GREAT BRIDGE I have a real appreciation of the grand accomplishment the Brooklyn Bridge was. 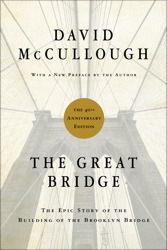 THE GREAT BRIDGE is a McCullough classic that I would recommend to anyone who enjoys history. Thanks to the publisher for providing a copy of this book and to Booking Pap Pap for his fantastic review. As long as the writing is engaging and not dry, this is exactly the type of thing I love...stories about real things and places. It makes my head buzz. I generally find books like this fascinating when they're well written. I think Carl might like this one too if he had the time to read. Great review! I tried listening to this but I'm afraid to say I lost interest in all the details. But I also got the impression it would have been better to read it than to listen to it! I love everything from David McCollough! Will add this to my list. I adore McCullough and have been meaning to read this for ages. I plan to rewalk the bridge after I've had a chance to read the book.